Free tool for removing Outlook folder permissions for selected users in bulk. This utility removes selected users from permission lists of specified Outlook folders in Office 365, Exchange Server mailboxes and Exchange Public Folders. Free tool for removing Outlook folder permissions for selected users in bulk. 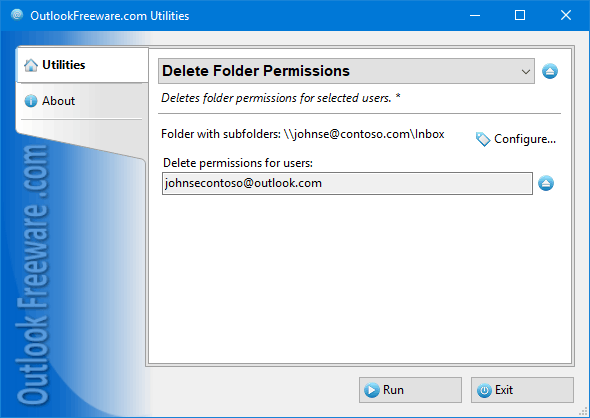 This utility removes selected users from permission lists of specified Outlook folders in Office 365, Exchange Server mailboxes and Exchange Public Folders. The utility works with user permissions on folders of any type: mail, calendars, contacts, tasks and others. It allows you to revoke the permissions of selected and anonymous users, as well as default permissions. Add personalization to ANY email address list. If your lists currently do NOT include first or last names, load them into Name Extractor and they will. Then take advantage of personalization features in any bulk emailer and increase your responses.